The Candidates who have wish to Getting Eligibility for Asst. Professors / Lecturers in various universities and degree colleges Post Recruitment the Telangana State Candidates can apply TS SET. The Osmania University Vice-Chancellor has announced the TSSET 2019 notification on 27-03-2019. 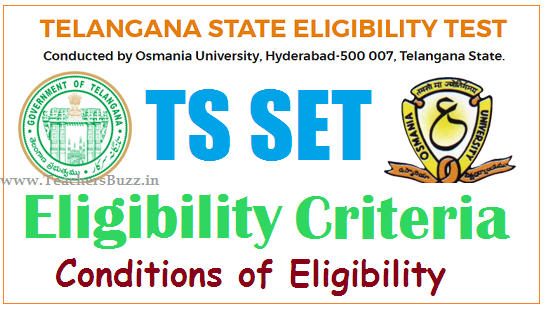 Telangana State - State Eligibility Test (TS-SET-2019) for the year 2019 will be conducted by Osmania University, Hyderabad in accordance with G.O. Ms. No. 16 Dt. 09-06-2016 for recruitment and promotions of Lecturers/Assistant Professors in Degree Colleges/Universities as per the University Grants Commission Regulations. Eligible Candidates who wish to apply for TSSET 2019 may submit their applications through online mode. The registration fee of Rs 1200/-(for General Category), Rs 1000/-(for B.C. category) and Rs. 700/-(for SC/ST/PH/VH category) may paid towards the application registration and processing fee through payment gateway (Credit card/ Debit card/ Net banking ) the detailed information regarding the eligibility, Syllabus and model question paper, test centers, related instructions, fees for late submissions and procedures for online submission of application are available on the websites osmania.ac.in and ouset website. The candidates who are going to apply to TS SET 2019 the candidates should have a Masters Degree from a University Grants Commission recognized university with minimum 55 per cent marks for General / Backward Class candidates and 50 percent marks for SC / ST / PH / VH. Candidates who are appearing in the final year of their Post Graduate examination may also appear in this examination. i) The candidates who have secured at least 55% marks (without rounding off) in Master’s Degree (i.e., M.A., M.Sc., M.Com, MBA, MLISC, M.Ed., M.PEd., MCJ, LLM, MCA and M.Tech (CSE & IT only)) are eligible to apply. However, in case of the Backward Classes (BC)/Scheduled Caste (SC)/Scheduled Tribe (ST)/ Persons with Disability (PwD) category candidates who have secured at least 50% marks (without rounding off) in Master’s Degree is eligible for this Test. ii) The candidates who are pursuing their Master’s Degree course or the candidates who have appeared for their qualifying Master’s Degree (final year) examination and whose result is still awaited or candidates whose qualifying examinations have been delayed may also apply for this test. However, such candidates will be admitted provisionally and shall be considered eligible for eligibility for Assistant Professor / Lecturer after they have passed their Master’s Degree examination with at least 55% marks (50% marks in case of BC/SC/ST/PwD (Persons with Disability) category candidates. Such candidates must complete their Master’s Degree examination within two years from the date of SET result with required percentage of marks, failing which they shall be treated as disqualified. iii) Candidates belonging to third gender in other words transgender would be eligible to draw the same relaxation in fee, age and qualifying criteria for TS-SET examination as are available to SC/ST/ PwD categories. The subject wise cut-offs for this category should be the lowest among those for SC/ST/PwD/BC categories in the corresponding subject. iv) The Ph.D. Degree holders whose Master’s level examination had been completed by 19th September 1991(irrespective of date of declaration of result) shall be eligible for a relaxation of 5% in aggregate marks (i.e., from 55% to 50%) for appearing in SET. v)Candidates are advised to appear in the subject of their Post Graduation only. vi)See the list of Subjects in Point No. 13 (Page no-12) which TS-SET examination is being conducted. vii) Candidates are neither required to send any certificates/documents in support of their eligibility nor print out of their Application Form (Confirmation Page) to TS-SET office. However the candidates, in their own interest, must satisfy themselves about their eligibility for the Test. In the event of any ineligibility being detected by the TS-SET at any stage, their candidature will be cancelled and they shall be liable for legal action. i) The candidates may pay the examination fee either by Credit Card / Debit Card, the additional processing charges as applicable will also be debited from the Credit Card /Debit Card of the candidate. ii)After filling all the details of the online application form for TS-SET examination, the candidate will have the option to select the mode of payment of examination fee either by Credit Card /Debit Card during the online filling of the application form indication their details therein. iii) Please note that Fee submitted by any other mode like Money Order, Demand Draft, IPO etc. will not be accepted. iv) Fee once paid will not be refunded under any circumstances.